Lee Jackson Maps - The first appearence of the 'Little Boney' image. The first appearence of the 'Little Boney' image. German Nonchalence; _or_, the Vexation of little-Boney. London, H.G.Bohn, 1851. Etching, 255 x 360mm. Coloured. Trimmed from larger sheet, narrow bottom margin. 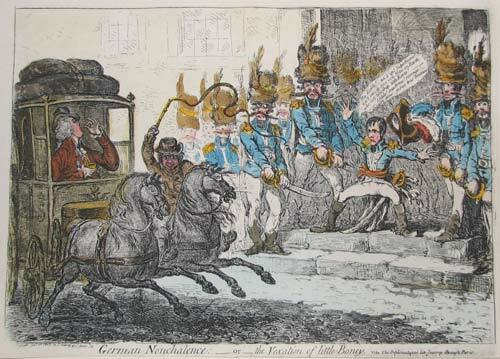 Gillray's first cartoon to depict Bonaparte as 'Little Boney', first published 1803. Napoleon is beside himself as the Austrian ambassador passes through Paris without bothering to present himself to court, only a few months before Napoleon made himself emperor. In reality Napoleon ordered the Count, who was en route to London, to leave Paris at short notice.